Many famous competitors will participate in class MOTO/ATV in the rally raid class. 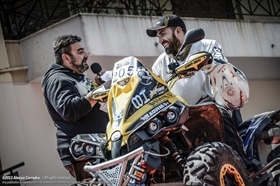 The organizer of HELLAS RALLY Meletis Stamatis will participate with ATV, together with popular Greek competitor Thnasis Kouvas. In class MOTO will ride the most popular Bulgarian in rally competitions - Dimitar Boevski. The winner of “Balkan Marathon Rally” will start his preparation for African race “Africa Eco Race”.